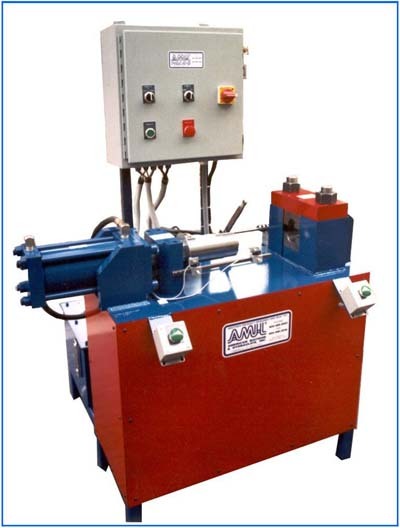 Model 3212-SA-2P Tube End Forming Machine : American Machine and Hydraulics, Inc.
Place tube into clamps and up against the tube stop. Cylinder advances and forms and makes micro switch and stops. Cylinder retracts and makes micro switch. Remove part. Tube stop arm will automatically re-position for another cycle. The model 3212-SA-2P is a completely self-contained end forming machine. It requires a supply of shop air to operate the tube stop system. The machine is normally shipped without hydraulic fluid. First add fluid, plug it in, hook up the air supply and you’re ready to start production. The model 3212-SA-2P has the capacity to expand, reduce, flare, flange, dome and bead as well as other special applications with development. 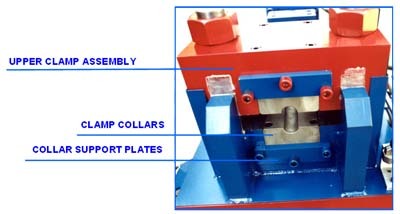 Note the ideal positioning of the critical components such as the adjustable tube stop assembly, the clamp collars, the forming tool and the adjustable 12 volt micro switches. All of these important features are conveniently located and can be moved, changed or adjusted with ease. Approx. Weight Without Oil - 2100 lbs. The hydraulic clamp is raised and lowered on 2 shafts 2” in diameter. 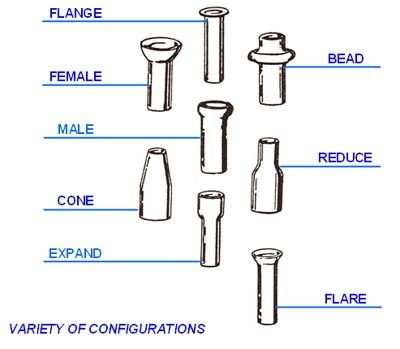 Larger diameter shafts are used for higher tonnages. Clamp dies are retained with socket head screws and reinforced with backup plates and 2” welded gussets for added strength. All tooling is manufactured from tool steel and heat treated to more than Rockwell RC-62. In some applications tooling is also nitrated for longer wear life. 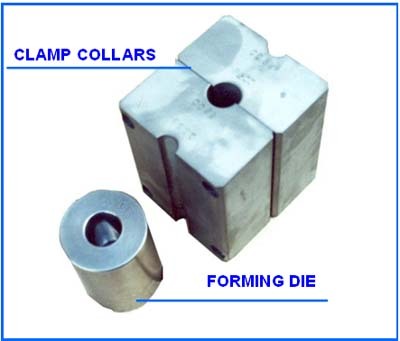 In most applications, clamp sets are capable of forming two diameters for greater versatility and economy. 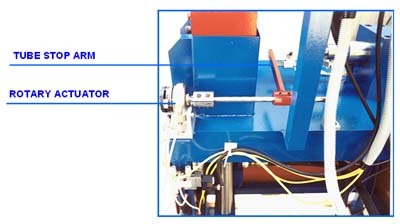 The tube stop assembly is operated by a pneumatic rotary actuator. A proximity switch insures that the arm is retracted before the form cylinder can advance, eliminating potential damage.